It has a very distinctive logo that you will see if you are at a european or middle eastern airport. Here is some history about the airline and links to the carriers website. In September 1947 the airline came into being and was a mixed venture between the Cyprus Government and the then British European Airways, and the company starting flying in 1948. After 3 years, the airline had a fleet of 6 DC-3 aircraft, flying on various regional routes from Nicosia International Airport.. In September, 1957, all aircraft were sold, and the company decided to enter a 5 year agreement with BEA to operate services on its behalf. Starting in late January, 1958, BEA took over all services, and two years later, de Havilland Comet 4b were introduced on the Nicosia, Athens, Rome, London route. In 1969, the first Hawker Siddeley Trident joined the Cypriot fleet. During the Turkish invasion in 1974, two of the five Trident jets belonging to the carrier were damaged beyond repair. Limited operations from Larnaca were restarted in early February, 1975. In 1992, the national carrier established a wholly-owned charter subsidiary called Eurocypria Airlines, and a decade later, it founded Hellas Jet in Athens, Greece. After holding 75% of Hellas Jet for almost 3 years, Cyprus Airways sold all but 24% of it to Air Miles in 2005. In March, 2007, the airline had 1,220 employees. 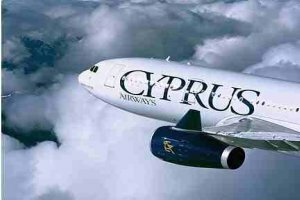 Cyprus national airline is owned by the Government of Cyprus (almost 70%) and various private shareholders. No fatal accidents involving Cyprus Aircraft have been recorded so far. What Aircraft Do They Have In The Fleet? What Destinations Do They Fly To? If you want to fly to America or Australia or the Far East or further afield you will need to fly to a major hub and take a connecting flight from there. Destinations such as Moscow fall under the european heading and of course you cannot fly to Turkey with Cyprus Airways for obvious reasons. What Language Can I Get Information In? How Can I Access Cyprus Airways? Anything about In Flight Services? If you want to be really upto date with social media you can now book your flight through the airlines FACEBOOK page.